BB Note: At his term end Claderon estimated over 25k dead in clandestine graves in the border states. Mexico does not count economic migrants missing from other countries, and the missing are never moved to the dead count unless evidence is located to prove their death......Amnesty International estimates 12k per year migrants 'go missing'. Unsolvable links are shared by clandestine graves with missing persons; with nefarious links that expose a widespread reality that has existed for decades and intensified in the 21st Century for Mexico. How many are there? Where are they? Why are they here? Who killed them? The figures are uncertain, but the terror and the pain are perpetual. Throughout Mexico in tropical forests, under bushes and thickets, on the prairies, savannas, and deserts of the terrain there are clandestine graves. But also they are in the empty lots in cities and towns. There are virtually thousands of corpses that do not appear in any statistics, never the less they are homicides. "Enough already with making excuses such as "before it was worse, we did not to know what to do, we didn't know what to combat or who created this situation, we did not effectively address the security problem. Enough of the looking for justifications that allow for the reproduction of so much violence and delinquency. If the current trend of social statistics remain we will actually end 2016 with 19,560 direct victims of homicide and many more victims who will pay the consequences of a country where it's institutions have failed to guarantee social peace nor has respect for human rights." To the findings of the clandestine graves, those of whom we do not know, who they are? They continue to sprout like moss and ferns in any season, in every ecosystem or habitat. Between January 2014 and July 2016 the people located, but gender undetermined, totaled 968 Mexicans and 83 foreigners. The largest number appeared to be in the age range of 20 to 24 years (151), followed by the age of 25 to 29 (145) and the 30 to 34 age group (120). These are the statistical figures presented by the Executive Secretary of the National Public Safety System, Federal Jurisdiction. These are the total number of persons related to preliminary investigations initiated during the period between Jan 2014 and July 2016 and remain unaccounted for by the Court as of July 31st, 2016. The states with the highest number of missing persons according to the Federal Courts are: Guerrero, 280; followed by Vera Cruz, 195; Tamaulipas, 146; Coahuila, 49;(Coahuila alone est 1300 by NGO) Michoacan, 41; Mexico City, 35; Oaxaca, 30; Nuevo Leon, 28; Chihuahua 26; and Sinaloa, 24; according to SESNSP. As for the regular state courts, add 20,636 men and 6,792 women. This is the total number of records of missing persons related to preliminary investigations under state jurisdiction as of July 31st, 2016. Of these, 25,339 are Mexican and 139 Foreigners, although there are another 1,950 that remain "unspecified". In municipal courts, the missing persons recorded are young. An unnamed number are in the range of 15 to 19 years of age. Next are 3,547 between 20-24 years; 3,497 between 25-29; as well as 3,139 between 30-34 years of age. The last change to this number was made as of August 31, 2016. In this case, the state with the most is Tamaulipas with 5,560; followed by the State of Mexico: 2,649; Jalisco: 2,476; Nuevo Leon: 2,311; Sinaloa: 2,220; Chihuahua: 1,799; Coahuila: 1,586; Sonora: 1,088; Guerrero: 1,047; and Michoacan: 1,043. 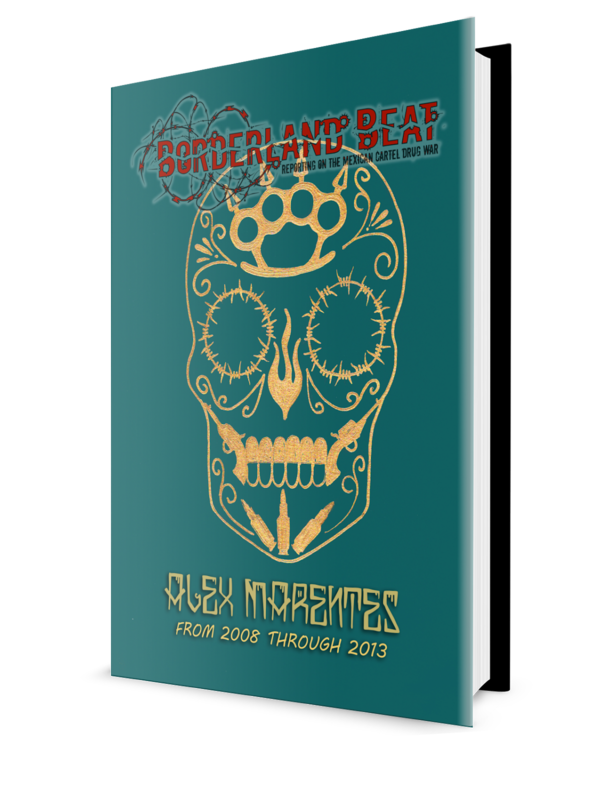 "At the end of the year 2015, the Mexican Government reported that 27,638 persons were missing (20,203 men and 7,435 women) and /or in undisclosed locations; but did not specify how many of them had been subjected to forced disappearances. Generally, the few criminal investigations into these cases had deficiencies and the authorities were not searching for the victims. The impunity for these crimes is absolute. In October, the Attorney General of the Republic appointed a Special Prosecutor to take charge of these cases." The clandestine graves do not speak. There are other figures published by the PGR. Until February 2016 they had found 202 graves with a total of 662 bodies (2014 and 2015). This figure was surpassed by many, because in March alone in La Mira, Michoacan they found one with two bodies; another at the Ranch "Las Camelias "near Lazaro Cardenas with two more. 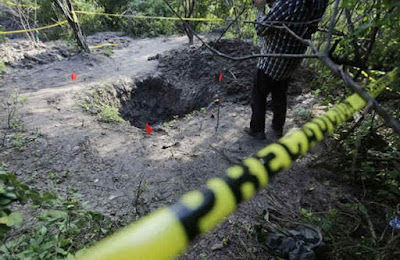 In Mexcaltepec, Guerrero, a grave was found with the remains of one person, in Taxco yet another, in Coatzacoalcos, Veracruz, one person; in Piedras Negras, Coahuila, one person and in abandoned fields near San Andres Calpan in the state of Puebla were found 12 cadavers stuffed into metal drums. April, for example, was a month of findings: a grave with six bodies by the highway to Playa Pascuales, Colima and another in the municipality of Tecoman with two more, in Caleras, Veracruz 11 graves with charred remains; 8 more near Xalapa; in La Bartolina, Tamaulipas: an indeterminate number. In Puente de Ixtla, Morelos, one and in addition in Zapopan, Jalisco, one. In May: Chilapa, Guerrero: two, in Manzanillo, Jalisco, three graves with seven bodies; in Tlayecac, Morelos a number indeterminable. In June: three graves in Luvianos, State of Mexico with five beheaded bodies; Mazatlan, Sinaloa four graves with six bodies; in the neighborhood of Nueva Orleans, Chilapa, Guerrero, ten bodies; Acapulco, Guerrero: in the highlands near Cerro El Veladero: three graves with ten bodies. July: Mazatlan, Sinaloa, two graves with eight bodies; Manzanillo, Colima three graves with seven bodies and in a fire pit in Huehuetoca, Mexico State, twelve bodies. August: two graves with two bodies in Jacuma, Michoacan; in Acapulco, Guerrero in the neighborhood of Generation 2000 two graves with three bodies and in Degollado, Jalisco one grave with four bodies. September: Santa Cecilia, the amphitheater of Acapulco, Guerrero, seven bodies in four graves; Palo Gordo, Zapopan, Jalisco one grave with various bodies; Taxco, Guerrero: twelve bodies in several mass graves and in Apaseo El Alto, Guanajuato: two bodies in a grave. These are only examples. In half the states of the Republic,16, there are more resulting from the actions of organized crime, drug trafficking, kidnapping, human trafficking, and diverse crimes of federal and/or state statues. There are also those that are made out to look like crimes of passion or other types of disappearing of bodies. Confronting this situation, the Federal Government assures us that they are compiling a register of clandestine graves. Perhaps they have taken steps to fulfill a good part of the requests made by various organizations working on behalf of the disappeared, by creating the National Databank of Missing Persons (with reliable data) and the active participation of The Attorney General of the Republic and local prosecutors offices. To date, the authorities of the PGR and State Prosecutors have failed to perform the work required to assess the number of graves and bodies. 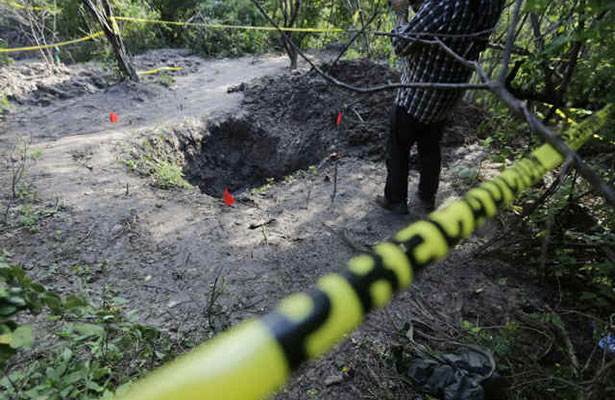 Due to this, groups such as "The Other Disappeared of Iguala", The National Brigade in Search of Disappeared Persons in Veracruz (which has found 90 graves in total as of September), the Collective for Peace and the Collective El Solecita are among the many other groups involved in tracking down the graves of missing persons. So problematic is the situation that in April 2016 the Program For Victims and The Scientific Commission for Human Identification of the Autonomous University of the State of Morelos (UAEM), in collaboration with the Retono Network and the National Commission of Human Rights (CNDH), presented a workshop called: "Theoretical and Practical Tools for the Effective Search for Missing Persons". The aim was for the families who have decided to make the search efforts, to have the conceptual and practical tools for such an activity, with a methodology that reduces security risks such as the alteration of the site find and /or crime scene. Some of these citizens groups who are currently finding graves attended the workshop which was held on the premises of the National Commission of Human Rights (CNDH); which involved 35 families of victims, members of various social organizations, families of missing persons from the National Network links, formed by the Association for the Disappeared of Baja California, the Collective of Families of the Disappeared from Cordoba Orizaba, Veracruz; The Life Group, Coahuila; Justice for Our Daughters, Chihuahua; Others Missing, Guerrero; and United for Life-Bloodhounds, and Sinaloa Voices along with personnel of the Commission. At the aforementioned workshop, they said that in the context of the establishment of the First National Brigade Search by the Relatives of Missing Persons Network Links, composed of searchers in solidarity from different states, that which will be accompanied by the Autonomous University of the State of Morelos, civil organizations, the media and people with a common purpose. 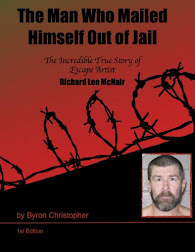 Sad to say, reading this reminded me so much of the documentary/movie "The Killing Fields". For me the most depressive part is this --> "The impunity for these crimes is absolute." Yes, very sad but that is why I am doing this. More people everywhere need to realize the killing fields are not always in some far off land but in all our backyards. Only the outstanding events make the US press at all and we know what happens to journalists in Mexico . The brave may very well end up in one of these graves. I hope you also read dd's excellent post from the NYTimes. OS, but are you all still working on that story on human trafficking? Saw piece on fusión network, they went to tenancingo to investigate. Was sad story. BB doing great job. Thx for all the informátive stories. Who said "we like to throw one little country against the wall, for practice"? --Well, it is mexico's great big chance at greatness, getting thrown against the wall and pushed around while the mexican department of the "defense" helps the executive stay put and enjoy their great impunity. --Lastima de güebos, "to be man enough and disciplined" to be a lambegüebos de unos pinchis politicos rateros y asesinos while thinking you are serving the country.